Oh boy. Guess what happened yesterday? Ready? You’ll never guess. Give up? K. The Fedex truck, which I so lovingly adore for bringing me delightful packages, HIT OUR CAR and then drove away. Really? Who does that? Especially in a company vehicle? ESPECIALLY especially with witnesses? Thank goodness for our nice neighbors who saw everything and let us know! Hopefully this will easily be taken care of… So far I’m not impressed. Despite that downer of a situation, at which I was fuming pretty heavily, yesterday was *awesome* because of: MY LUNCH! Yes, you are looking at my lunch yesterday. 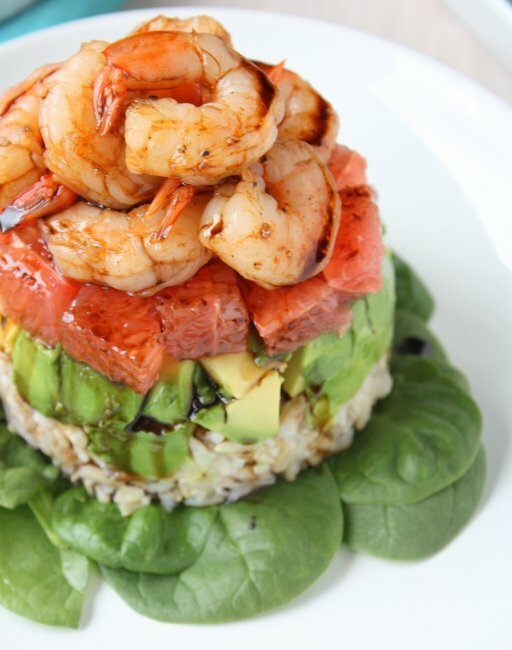 Shrimp, on top of grapefruit, on top of avocado, on top of rice, all covered in a balsamic reduction. I tell you, it was perfect. I was really quite proud of myself for throwing together such a delicious lunch, and while I wasn’t planning on it being a blogable meal, it’s worth it. 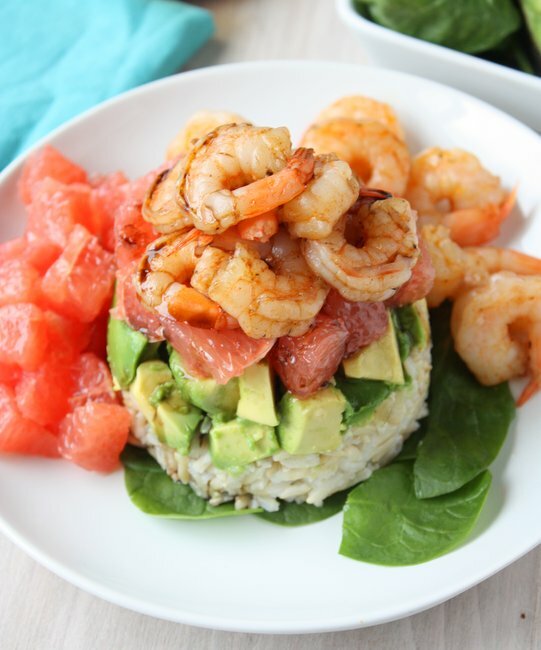 Not only is this a phenomenal lunch, but this would be a great (EASY) thing to cook for guests. With a little shaping, it looks fancy! Get on it! You’ll impress the pants off of everyone! My secret? 1-cup measure. I don’t have any fancy rice molds or anything, so I used a 1-cup measure, put the avocado cubes *gently* in the bottom, then pressed the rice in, then plopped it over onto a plate! Voilà! You could probably use a ramekin, or a short glass… Get creative, people! Make this sucker up, then drizzle some balsamic reduction on and you have a winner! I’m sorry I don’t have a recipe on here (yet) for balsamic reduction, but it’s a skill you should definitely learn. It’s worth it. YUM. Now do yourself a favor, and go make this for lunch. ASAP. It won’t be grapefruit season forever! In a saucepan over medium heat, cook the shrimp in the chili oil until opaque and starting to brown. Remove from heat, and season with salt and pepper. In the bottom of a cylindrical cup or measure, gently pack 1/2 of the cubed avocado as tightly as you can. 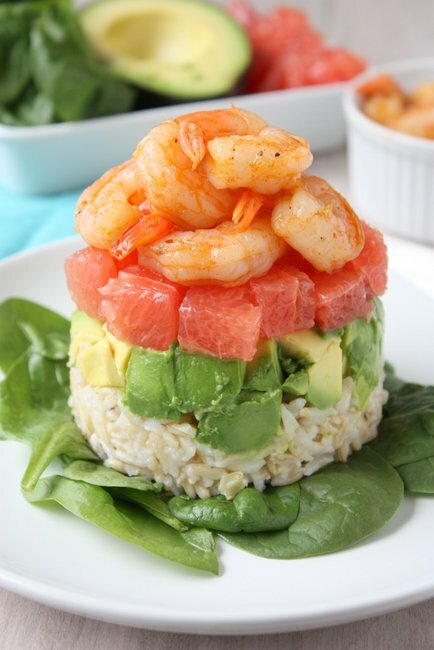 Cover with 1/2 cup rice, and pack down gently, yet firmly. 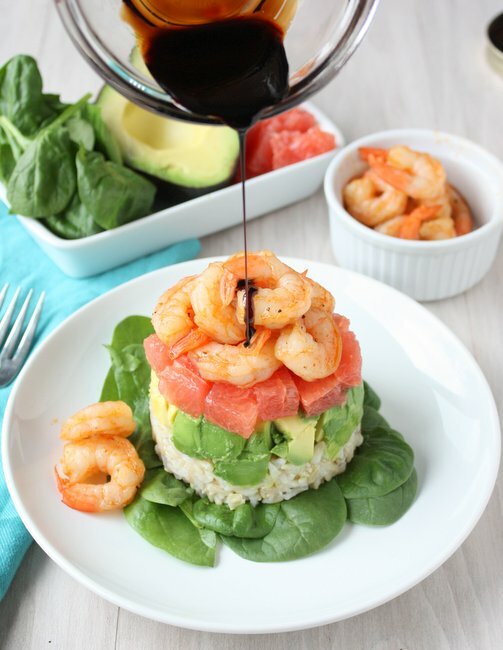 Invert onto a plate prepared with a bed of greens (optional), then top with a layer of grapefruit, the shrimp, and a drizzle of the balsamic reduction. Best served immediately, while the shrimp are still hot! Oh, what an amazing lunch! It would almost make up for the car hassle…but not quite. Insurance claims are the worst. 🙁 Hope you get it all sorted out soon! lovely presentation! it looks good and healthy! This looks incredible! 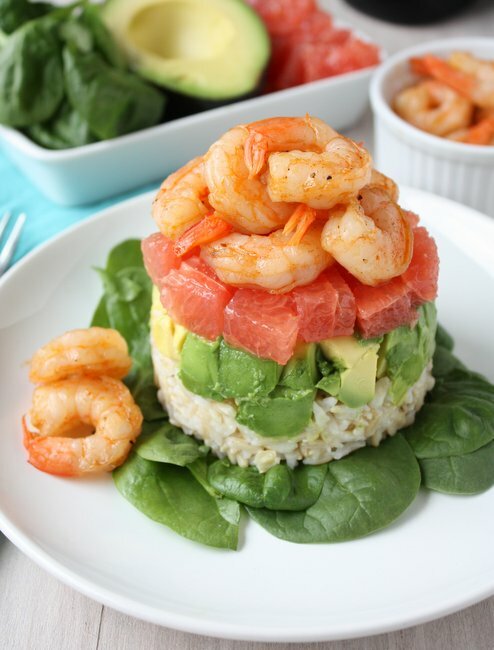 What a fantastic idea for a quick *and* nutritious lunch! Can’t wait to try this. Hmm the grapefruit flavor is pretty awesome here, but I suppose you could substitute another citrus! Try oranges or tangerines! Thanks so much for the response 🙂 I’m thinking maybe blood orange– get the citrus tang and preserve the lovely colour balance! Blood orange crossed my mind, too! It would be beautiful! Just found this recipe and sounds delicious! Never had balsamic reduction though, is it similar to soy sauce or no? Looks interesting, but am unable to eat grapefruit because of meds. Have you tried any other citrius fruit?